Although as a youngster I certainly wanted to write, I felt a pre-requisite of becoming a composer was a thorough knowledge of musical history and musical language. The study of harmony and counterpoint from medieval methods through to the serialists absorbed me until my mid-twenties - along with the process of becoming a musician. I had written some songs, somewhat in the style of Britten, but I didn't really like Britten, and neither did I like the serialists, so what was modern music meant to sound like? I wondered. At first I remember thinking Messiaen had the answer, but his language was too heterogeneous and idiosyncratic, too powerful even, to allow imitation. The catalyst for me was hearing the music of Ligeti, not so much the early adventures, but works like the String Quartet no. 2, the Chamber Concerto, and the Three Pieces for Two Pianos, which I heard the composer talk about at Darmstadt. Ligeti's melismatic style in particular was what drove me forward and I developed a technique in imitation of it. His music carried a sense of being grounded which serial music lacked, combined with his great inventiveness and artistry which made it constantly fascinating. 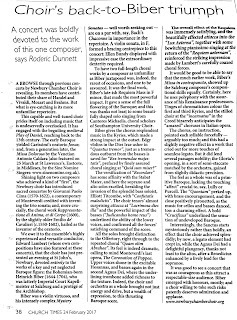 Of course, I lacked Ligeti's vision; right from the start I can remember wanting to construct pieces which sounded 'classical' not in their language, but in their shape and structure. I also developed ideas of consonance, derived from my studies of musical science at Oxford, in particular Helmholtz' diagrams of dissonance and consonance based on beating harmonics. I was also interested in simplicity alongside complexity, and realised that many a classical piece has passages of both. In real life, these contrasts were played out in writing pieces for the concert hall in the early 1980's while at the same time taking part in pioneering outreach work in schools. It didn't feel appropriate to introduce 'modern music' into the classroom; I wanted younger kids, especially, to show me what they could do and I wanted to arrange their work in a way which suited their style rather than mine. So I developed a certain musical schizophrenia: a sort of opaque lyricism on the one hand and a transparent harmonic and rhythmic style on the other. These styles I thought irreconcilable in my own music - although they did begin to move towards each other - until I came under the spell of John Adams, a composer whom I reckon to be as great as Handel, Mozart and Beethoven. In his music, I hear a polyphony of musical styles which have been fused together with increasing success, and which have revitalised the musical language of today. A browse through previous concerts by Newbury Chamber Choir is revealing. Its members have contributed their share of Handel and Vivaldi, Mozart and Brahms. But what intrigues its eye-catching less familiar repertoire. 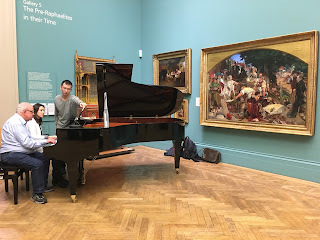 It was thrilling to be able to attend the first performance of my Aspects of Work in the Pre-Raphaelite Gallery of Manchester Art Gallery where Ford Madox Brown's famous panorama of Victorian life is beautifully displayed. Translating a picture, especially one as far reaching as this, into another art form seems an unlikely task: music can make a good attempt at capturing the mood of a painting - but ‘Work” is a complex and compressed panorama of Victorian life, and interpreting all that in musical terms was going to be a challenge. The realism of “Work” is typical of the Pre Raphaelites (of whose brotherhood Brown was never actually a member) with their immense attention to detail. “Work” took 10 or more years to create. I was attracted to the very idea that Brown was also celebrating his own labour of love, a delight in an achievement that is hand made and crafted with great skill and care, hard toil, patience and perseverance.